and a child much adored. Very often we fool ourselves into thinking that ours is a formulaic God, and if we do just what we think we're supposed to do the way we’re supposed to do it, prayers will be answered. Here’s the tricky part, and I learned in from a sermon by TD Jakes when he preached “every prayer does not get answered.” Wow. That’s deep. It’s also disconcerting, because we’re taught to pray and believe that our prayers will be answered. But faith is larger than formula. Faith isn’t just relying upon the practice, the process. Faith is beyond process. Process speaks to our logical minds. Faith can feel like diving off a cliff. Prayer is earnestly believing that God works it ALL out, according to His purposes, whether that ultimately agrees OR disagrees with our plan. You see, prayer isn't shopping, even if we think it should be. Matthew Henry writes of the 40th Psalms that "There is power enough in God to help the weakest, and grace enough to help the unworthiest of all that trust in him." All we need to do is trust. We're back to the surrender thing here..our only job is to come humbly. I have found that there are three stages to every great work of God: first it is impossible, then it is difficult, then it is done. We serve a mighty God. He created us in His image, but He doesn't need our suggestions. He knows what is best for us; His plans are better; we exist to serve Him, to live our lives in Praise. 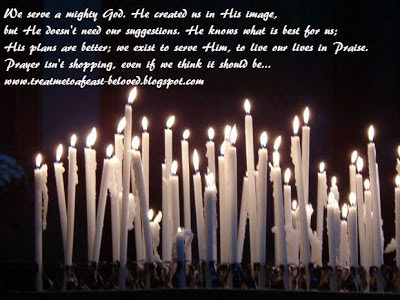 Prayer isn't shopping, even if we think it should be. Prayer is an opportunity to connect, to still ourselves to hear, to be healed, to be encouraged. Prayer is a conversation between a Loving Father and a child much adored. God has already worked it all out, and that's the promise. That's today's evidence that God is good.